This crocheted rug has been a work in progress for quite some time. I’m happy to say its done — Yea! It is completely crocheted from plastic trash. I used recycled bags from bread, hotdog buns, bagels, toilet paper, frozen foods, hashbrowns, paper towel packaging, hamburger buns, taco shells, hoagie buns, and other pieces of plastic from numerous products having plastic packaging. This plastic is the heavier gauge stuff and it’s much harder to crochet and does make your hands and joints sore. Because this plastic was much heavier than the normal thin plastic grocery bags, I cut the strips only about 1/2 inch wide. I cut the plastic into strips using my standard plarn making method to assemble the plastic strips. I crocheted it all using single crochet stitches as this is a bit easier on the hands. A word of advice though, take lots of breaks from this project as it will help your hands and joints from getting too sore. Also if your rug doesn’t want to lay down flat, apply some gentle heat from a blow dryer, and flatten out your rug as you warm up the plastic. This really helped as my rug wanted to curl up a bit but with the heat from the dry blower, I was able to get my rug to lay down fairly flat. Below you will find the general directions for crocheting this recycled plastic rug. Please be aware that this pattern is just a loose guideline for making your own unique rug using recycled plastic. You may need to add a few more stitches here and there so your ends lay down flat. I re-worked several rounds at times as the rug just didn’t want to lay down very flat. But remember the dry blower tip and try this out if needed. With that being said, enjoy the project and happy crocheting! to create plastic bag yarn or plarn. My Easter basket project this year uses the bottom of a laundry soap bottle and plastic bags. I cut the bottom off a plastic soap bottle and used it as a base for my Easter basket. I then crocheted around the base and up with recycled plastic bags or plarn. The pink bunny was crocheted using AmiAmour’s free crochet pattern found here. This is my first official ami animal and while I’m not going into the ami making business, I was pleased with the outcome of my Easter bunny. Oh and I used cut up plarn for the grass in my Easter basket. That way it can be recycled after the holidays into another project. Happy Easter! at base 6″ wide and 3″ across. Here is my latest baby wearable I made for my granddaughter. 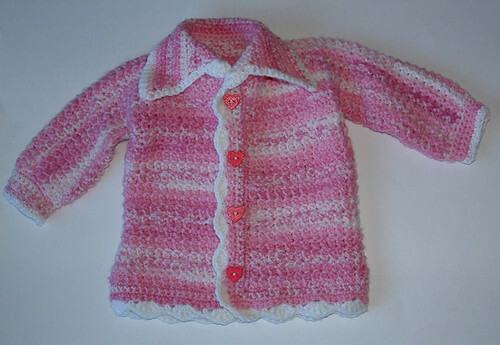 I crocheted this cute pattern by Beverly called Cat’s Meow Toddler Jacket using Bernat Baby Jacquards. It is a fairly easy pattern but I did have some questions and I thought I’d clarify a few issues that I had as I worked the pattern. First I wasn’t sure what the pattern was referring to when it read “Work over 26 patterns for 3 rows” after you finish the sleeves. I figured out it was talking about the vertically rows that this stitch pattern forms as you crochet the repeat pattern. I counted over 26 pattern rows which was about 10-1/2 inches from the sleeve edge and 4 inches from side edge in to neck. Next I found that the border needs to start on the left side as you are looking at it which is the actual right hand side of sweater. I also found that it was easier for me to do the buttonholes on the right side of jacket by starting from the top edge and working down. Because I started at the top, I worked single crochet (sc) stitches in the first 8 stitches from the collar down to the first buttonhole. Then I worked the first buttonhole ch 2, skip 2 sts, and then worked sc in the next 8 stitches and repeated down to bottom of the right side. I finished off the border by working a sc around in each st and 3 sc in corners the same as row 4 calls for in the pattern. I worked the collar’s first row by sc in each st and then skipping every 4th stitch but then I worked the remaining rows of the collar by sc in each stitch and 3 sc at collar points. I edged my sweater jacket with white contrasting yarn by working sc around the collar and cuffs and then I crocheted the ruffled edging around the rest of the sweater.